Hello, World. Throughout the year I will be posting dispatches about my journeys as a cinematographer. Since I am currently deep in the bowels of preproduction on Nancy, Please, an independent feature directed by Andrew Semans, let’s start with talking about the joys of pre-production. The film is a dark comedy about a grad student whose life falls apart when he is unable to recover an important book by Charles Dickens from his ex-roommate. It’s a funny and inventive script with a great producing team and we shoot this week! Andrew is an exceedingly well-prepared director and, more importantly, he brings a cohesive visual approach, which allows the collaborative process to launch from a solid foundation. In the initial stages of trying to figure out how to approach shooting a film, I will usually cull a host of visual references from films to art, and create a visual reference book. In drawing the style for Nancy, Please, Andrew and I discussed Paper Chase, shot by Gordon Willis, Harris Savides’ work on Birth (one of my favorite cinematographers!) as well as the works of photographers such as William Eggleston, Saul Leiter, and Robert Frank. All these works serve as guidelines to start talking about camera movement, framing, lighting, color palette. This is one of my favorite parts in working on films: the process of finding the language of the film with the director. You learn very quickly that no one thinks about filmmaking the same way. I’ve worked with directors who don’t like to move the camera, not even a pan, but I’ve also worked with directors who love to dolly, love handheld, love silhouettes, hate the color purple, the list goes on. I learn with every film because every film is a different creative process and stepping into new processes expands my sensibilities as an artist. 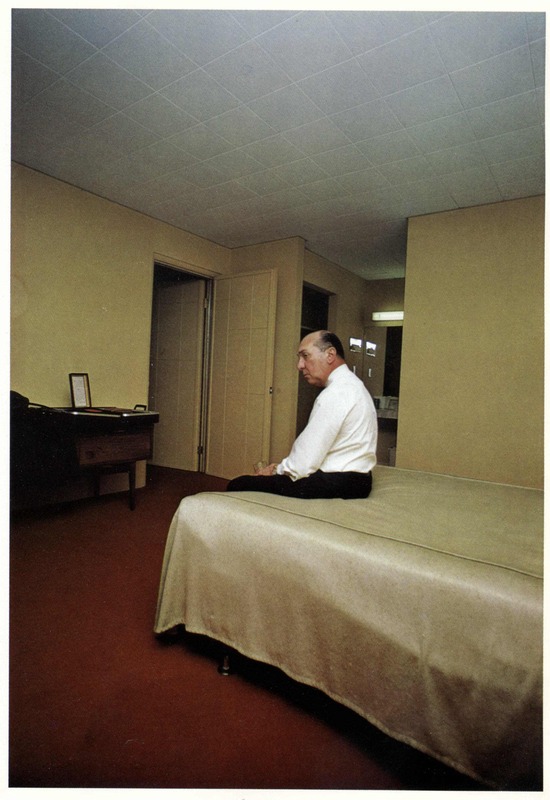 William Eggleston, Huntsville, Alabama, 1971. We were drawn to the color palette and the composition (lens choice and framing) which strongly conveys the man’s isolation. The cinematography I enjoy the most is when blocking and camera movement tell the story of the scene. I love working with the director and developing blocking that can allow the shot to stay alive for an entire scene. I always try to show Days of Being Wild in preproduction because I think that film is simple and yet masterful in its use of blocking and camera work. Brad and I really explored that in the Al and Ivy scenes walking through the city and at home with the dancing robot in The Exploding Girl. We planted the camera and let the camera describe the scene sometimes leaving the actor’s faces to catch their gesture. Kit and I also did something similar in her feature, Fog (currently on the festival circuit after premiering at Edinburg and Singapore). We tried to mesh Dardene brothers with Hou Hsiao Hsien, doing long choreographed handheld takes yet keeping it very still. I think we achieved a really interesting aesthetic, and I found that I love dollying while hand holding, it gives a great floating feeling. I’m so glad those two films were the first two features I shot because, through those films I feel like I learned how to see with the camera, how a long take can engage a viewer to really observe and discover things on screen. If the moment and the story is right, you don’t have to resort to cutting to new angels. Let’s find a way to let the camera do the talking, to let the camera show you the world. I try to remind directors when on set we get lost in coverage, shot reverse shot this and that, that we should be trying to cover the experience, not just dialogue. But that can be hard to remember especially if you are getting swallowed by the logistics and rushing to meet your page count every day, which comes to my next point below. 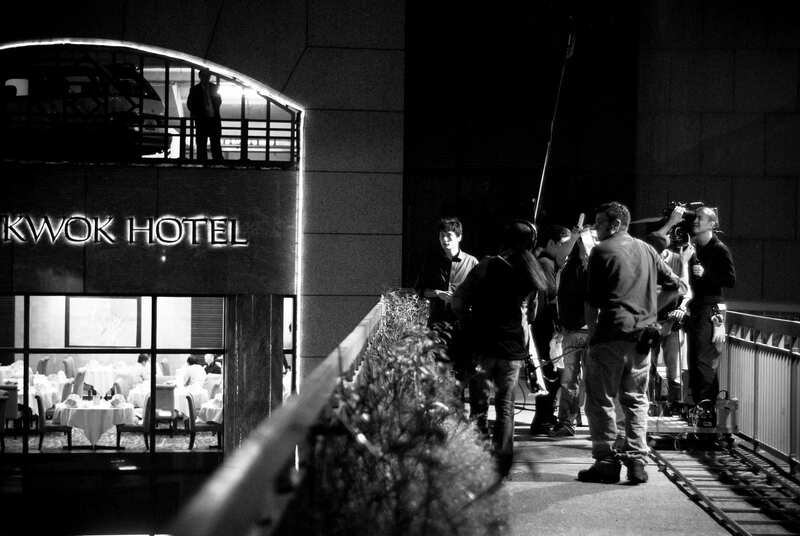 Shooting on an overpass in Hong Kong, on the set of Fog directed by Kit Hui. Photo by Ivy Lam. Days of Being Wild. I think it’s one of the best films Chris Doyle ever shot. Nancy Please, like many independent features, has an ambitious schedule. This will be my fifth feature as cinematographer and if I’ve learned anything through practice and working with good producers, it is how to better manage the schedule in order to protect the process. Again with The Exploding Girl, there would be times me and Brad would be brain dead at the end of a long shoot day, but we would take the time and energy to dig through the next day’s schedule because we wanted to allow enough time to for the creative process to happen. Now, whenever I look at a schedule and see that we are changing lighting setups, I try to find a way to steal scenes. I look for simple things we can break away and shoot quickly while the G&E team turns things around. Or, similarly, I try to start the day with scenes that don’t require a lot of lighting or rigging just so the lighting crew can get stuff going while we shoot. It’s common sense but it helps establish and maintain a momentum. I shot a short, Three Prayers for June directed by Inna Braude, that was scheduled almost eight pages a day (all night interior, one location), Law & Order speed shooting. I took this as a personal challenge to see if we could do it. It wasn’t easy with scenes that required a live chicken and a live fire, but we made it after even without the eighty person crew of Law & Order, though we did pull two fourteen hour days. 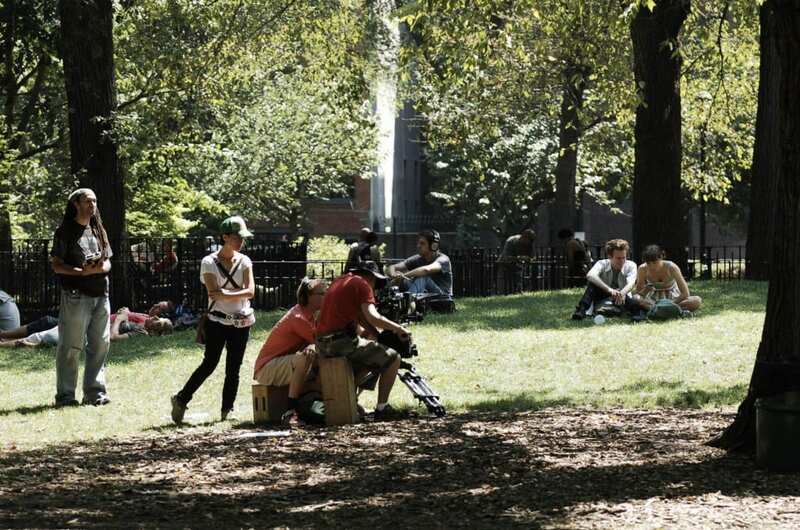 Shooting in Tompkins Square Park for The Exploding Girl directed by Bradley Rust Gray. Lastly, to geek out about the gear a bit: We are shooting Nancy, Please on the Red with the MX upgrade and Cooke S2/S3 lenses. I am really excited to be shooting this project with the Cooke Speed Panchros. In general, I enjoy putting older lenses in front of digital sensors like shooting with Zeiss Superspeeds on the Red. I find that modern lenses, especially on digital sensors, can sometimes feel very cold and maybe too sharp. The Cooke lenses are sharp but have a rounder, warmer look, with more flare, gentle focus fall off and great bokeh. The idea to use the Speed Panchros came about when Andrew and I talked about the look and feel of the film. It was clear that since the film is essentially about a man who is emotionally impotent and we wanted the film to have a lower contrast, muted look that matches his own lack of clarity and direction. Some films I like that were shot with Cooke Speed Panchros: An Education, Delicatessen, and Virgin Suicides. So much of digital cinema discussion is centered around pixel-peeping (e.g., codec, MB/s, resolution) and having enough information or latitude on the sensor to get the right look in post, what gets lost in the conversation is how much the lenses itself have to do with the personality of the image. I was tempted to try the Bausch & Lamb Super Baltars on the Red but they are hard to find and surprisingly not as cheap as I had hoped, putting it out of our reach—sadly. Harris Savides used them on both Birth and Margot at the Wedding, among others. Someday soon. Godard’s Band of Outsiders has a similar tale of a legless bird that never lands. I think that’s where WKW got it. This shot of Leslie dancing kills me. Eric Lin earned an MFA at New York University's Graduate Film Program. MISSING, a short film he shot for director Kit Hui, screened in official competition at the 2005 Cannes Film Festival. He also partnered with Hui again to shoot her debut feature film, FOG, in Hong Kong which is currently on the festival circuit, having screened at the Singapore International Film Festival and the Edinburg Film Festival. A narrative feature film Lin shot on the Red, entitled THE EXPLODING GIRL, premiered at the 2009 Berlin Film Festival and played at the Tribeca Film Festival. The Indiewire review wrote: "Eric Lin’s magnificent cinematography seals the deal: Expressive colors and gentle movements become as relevant to thematic construction as the characters themselves." THE EXPLODING GIRL was released theatrically in March by Oscilloscope Laboratories. In addition to finishing shooting UNTITLED HAITI PROJECT, directed by Patricia Benoit, a narrative feature film shot in Haiti and NY, also on the Red, Lin also recently wrapped production on SEMPER FIDEL, a feature film directed by Robert Pietri and shot entirely in Cuba. As a director, his short films have screened at festivals worldwide including New Directors/New Films, Telluride, and Clermont Ferrand. His short documentary, MUSIC PALACE, was nominated for a Student Academy Award and is currently airing on the Independent Film Channel. He was selected to workshop his feature film project, WHY WE PULL THE TRIGGER, at the 2009 Film Independent Directors Lab and is currently developing the film with producer Mynette Louie (CHILDREN OF INVENTION).